I think I’m still a little in shock that this day has even happened. That Mason is SIX Months old that it’s been SIX Months since my cousin Danielle posted this. That it’s been SIX Months since I gave birth to Mason. It feels like it was just yesterday. I can’t believe how fast it goes and I know in no time at all I’ll be writing his 12 Month post. Today was a good day! We woke up and I nursed him. Then I offered him his very first taste of sweet potatoes it was the first real food he’s had other than a little tiny bite of stuff here and there. He sucked juice from an Apple once. He LOVED that. I have pictures 🙂 So anyway back to the sweet potatoes. He seemed to like them! I made them myself. I just bought some sweet potatoes steamed them, mashed them and added water and some breast milk to make it really smooth. I’ve decided to make my own baby food because 1) It’s easy and 2) Because I want too. Basically this is how I feel if I wouldn’t eat it then why am I making Mason eat it? I *Think* he liked it! After a little bit of food some playing we went down for our nap. Yes that’s right I said we. I’ve been so tired lately so when Mason decided he was ready for a nap I decided I was too. He nursed and slept, nursed and slept, nursed and slept for like three hours. Six month Growth spurt anyone? I think that may have been it! 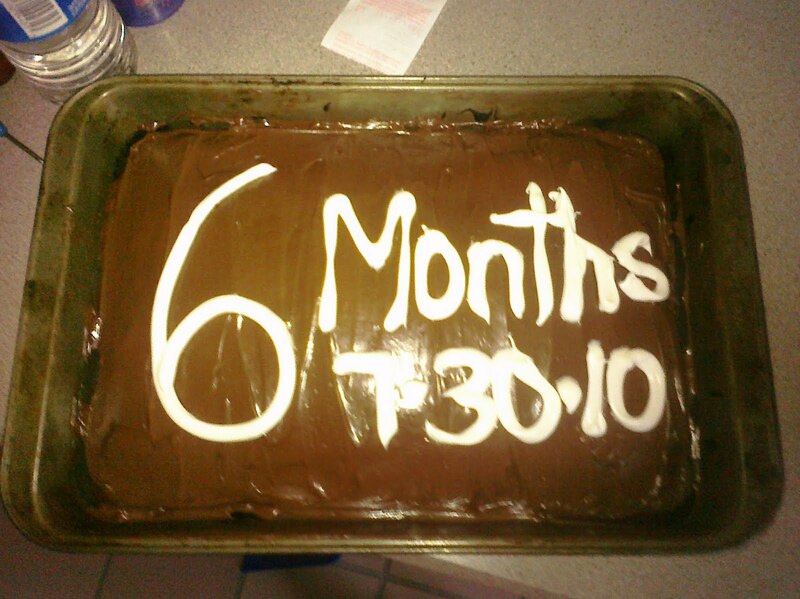 We didn’t sing Happy 6 Month Birthday yet. We will do it tomorrow because by the time everyone was home to do it today Mason was knocked out! So after dinner was done being made I went into the pool with Mason. It was his very first time and he seemed to love it. He was getting sleepy at that point though so we went inside since it was also getting cold and took a bath. He loves bathtime with his Mommy 🙂 He nursed and played and then nursed and went to bed. Not the best picture but a picture none the less! So today I hugged my baby, I played with him, I nursed him, smelled his baby smell and I cuddled with him because he still wants to do all those things. There will come a time all too soon that he will not be interested in cuddling with his Mom so I’m doing my best to take advantage of it now! Because I KNOW how blessed I am to have him in my life! um why can’t I put this in my mouth? Mason was EBF until his 6 month birthday when he got his first taste of *Real Food* Sweet potatoes! Doesn’t sleep through the night 🙁 But I don’t mind waking up to nurse him! Is still the light of my life! I don’t think words can even express how happy I am to have you in my life. EVERYTHING happens for a reason. The last 6 months have been nothing short of a blessing. I love you so much and can’t wait to see what life has in store for us! 12, 13, 14 Week Photos and Mason is 3 Months!!! Awww… he's getting so big! Happy 6 months to that beautiful baby Mason!! !